For me, it was in 2009 and I named it Norman. Up until then, I considered myself a normal person, with a normal life. Albeit busy. I’m a wife, mother, sister, friend. I’m a child of the late 50’s. I volunteer in my community. I try to be nice to people. I kept a journal, which I have now turned into a book! Not because I am so incredibly full of myself, but because when I was on my journey, I needed to hear a story with a happy ending while I was living my own. If you are like me (and if you are on this page, perhaps you are) you turn to the internet for answers. Back then, most of the answers I found were from many people with complications and post-surgical, ongoing issues. Thankfully, I also met a few people with happy endings to their stories. I wanted to share another story of hope, to balance out all of the stories otherwise available on the internet. If you live in the United States, and you feel so inclined to purchase a book, please buy it at or through Village Books in Bellingham, WA (if you want it signed) or if you are outside the US, through Amazon. (See the “Buy the Book” link above.) The book is currently not available in an e-format…I’ll let you know when that changes. 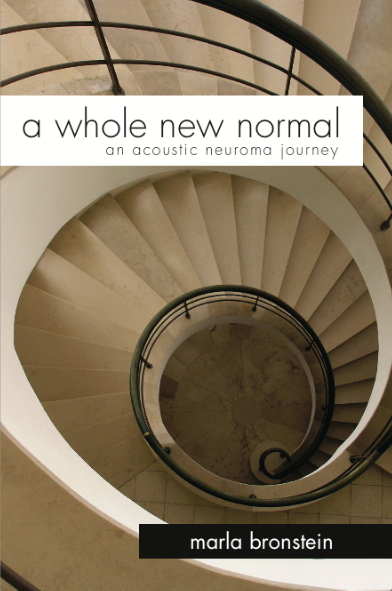 All profits from the sale of the book will be donated to the Acoustic Neuroma Associations of US and Canada. If you know someone who was diagnosed with this tumor, please direct them to this website or my Facebook page.